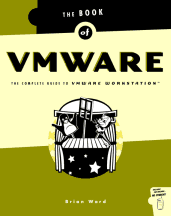 Flash: Plan 9 from Bell Labs is now available for VMware Workstation 3 as a pre-installed image. Try it. Chapter 10, Sections 10.2 and 10.3, starting on page 184: Make sure that you do not try to access the share as the Administrator user; most Windows versions won't let you do that. Create another user for this (and give it a good password). Chapter 5, page 99, step four: I talk about a directory /var/tmp/vmware-linux-tools, then do a cd /var/tmp/vmware-tools-linux. Transpose the words tools and linux in that latter command. Chapter 9, page 159: The RFC 1918 netmask for 172.16.0.0 is actually 255.240.0.0, not 255.255.0.0. However, note that 172.16.0.0/16 is a subset of 172.16.0.0/12, so if you set up a network based on the netmask in the book, you won't have any trouble.